Two Side Seal Machine(FT-N) - HCI Converting Equipment Co., Ltd.
For the side sealing operation of various poly bag's materials and composite films. 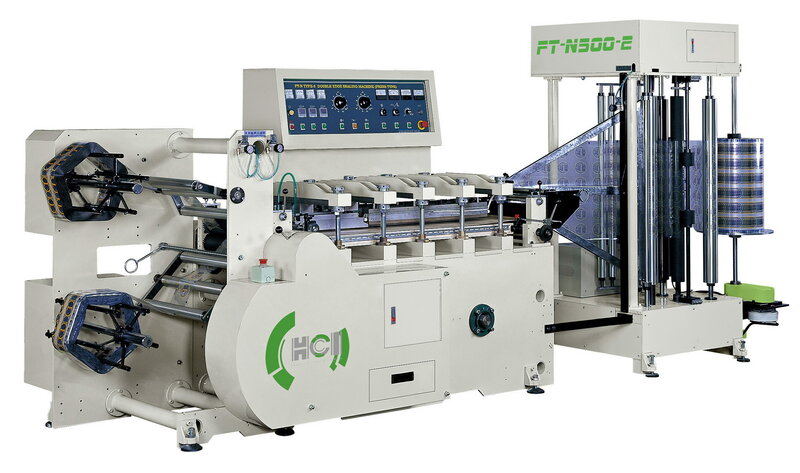 Used in conjunction with the FSC-303 Three Step Bottom Sealing and Cutting Machine, this machine produces the same three side seal bag as those produced by the FTSC-V series Three Side Seal Bag Making Machine. Vertical type unwind stand with 3" metal shaft makes the loading easier. Equipped with Web folding and center partition device. Unwind pneumatic buffer roller unit for auto feeding speed controls which assures the most stable web feeding even under high speed operation. Equipped with 2 sets of side sealing embossing unit and sealing cooler. Japan made auto temperature controllers provide the fastest heating performance. Two sets of rewinding dancing roller units for auto speed varied. Twin rewinding shafts allow two-line productions.